Parted Magic CD | Linux DVD Shop - UK Linux Shop supplying Linux on CD, DVD and USB with Free UK Delivery, 24Hr Dispatch. 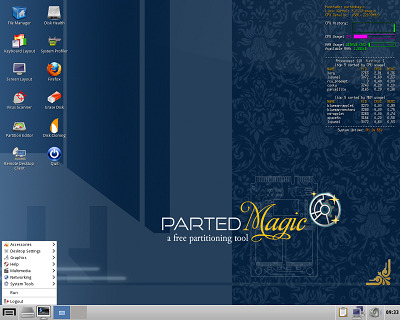 Parted Magic is a Linux CD with its elemental purpose being to partition hard drives and is not designed to be a "Rescue CD" nor is it based on another Distribution. Parted Magic OS employs core programs of GParted and Parted to handle partitioning tasks with ease, while featuring other useful programs (e.g. Partition Image, TestDisk, fdisk, sfdisk, dd, ddrescue, etc.) and an excellent set of documentation to benefit the user. An extensive collection of fileystem tools are also included, as Parted Magic supports the following: ext2, ext3, ext4, fat16, fat32, hfs, hfs+, jfs, linux-swap, ntfs, reiserfs, reiser4, and xfs. Parted Magic loads completely to system memory and requires at least 300MB of RAM to operate.